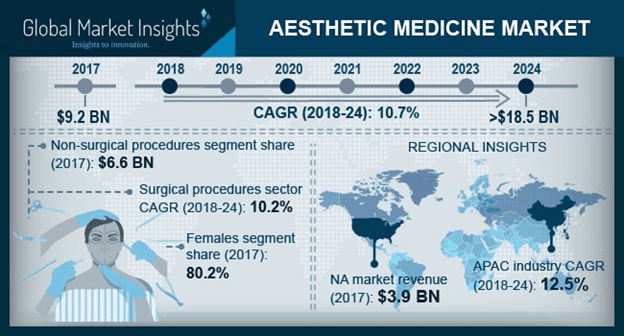 Aesthetic Medicine Market size is set to exceed USD 18.5 billion by 2024; according to a new research report by Global Market Insights. Increasing awareness among people regarding aesthetic improvements will drive the global aesthetic market during the forecast period. According to the International Society of Aesthetic Plastic Surgery, around 2.5 million facial rejuvenation procedures were recorded globally in 2016. Growing urge among people to look fit and youthful, high healthcare expenditure and availability of advanced healthcare facilities in developed economies will boost the demand for aesthetic procedures. Rising prevalence of obesity across the world will further drive the demand for fat reduction procedures thereby augmenting the aesthetic medicine market growth. Technological advancements in surgical and non-surgical aesthetic procedures to offer convenient, effective and less invasive treatments will serve to be another major driver that will surge the aesthetic medicine industry growth. Development of advanced devices such as miraDry system for hyperhidrosis, ideal implants for breast augmentation as well as nova threads for facelift procedures will increase the adoption of aesthetic procedures. Moreover, increasing investment in R&D to innovate novel technologies and products will accelerate the aesthetic medicine industry growth. However, excessive costs associated with medical aesthetic procedures and devices coupled with lack of reimbursement may impede the market growth over the analysis period. Stringent regulations regarding design, manufacture and import of medical aesthetic devices will further restrain the aesthetic medicine market growth. Non-surgical procedures segment accounted for the highest revenue share in 2017 and is estimated to show 10.8% CAGR during the forecast period. As per the American Society for Aesthetic Plastic Surgery, in 2016, the number of surgical and non-surgical cosmetic procedures performed in the U.S. accounted for 2.0 million and 11.7 million respectively. Increasing adoption of minimally invasive or non-invasive procedures over surgical procedures coupled with technological developments will drive segmental growth in the coming years. Facial aesthetics segment dominated the aesthetic medicine market with revenue USD 4.1 billion in 2017 and will continue to grow over the analysis period. Demand for facial aesthetic procedures such as facelift, nose surgery, eyelid surgery and various skin rejuvenation treatments is increasing among people across the globe. Moreover, availability of advanced products such as botulinum injections, dermal fillers, nova threads and other facial fat grafting devices will boost the adoption of such devices and foster the segmental growth in the foreseeable future. Females segment accounted for 80.2% revenue share in 2017 and estimated to witness healthy growth over the forecast period. Increasing Urge among women to look young and beautiful is the key factor that will drive the segment growth. Demand for breast augmentation, especially aged between 19-34 years, is increasing rapidly in recent years. Growing adoption of such aesthetic procedures among women will foster the segmental growth during the forthcoming years. Hospitals end user segment is estimated to witness 9.7% CAGR during the forecast timeframe. The segment growth is highly attributable to growing inclination of people towards aesthetic procedures, developments in healthcare infrastructure and rising disposable income in developed as well as developing economies. Furthermore, affordability of hospitals to buy high-cost instruments and availability of skilled healthcare professionals will further propel the segment growth in coming years. U.S. aesthetic medicine market accounted for USD 3.5 billion in 2017 and is estimated to show lucrative growth over the forecast period. Increasing demand for aesthetic enhancement, high healthcare expenditure as well as availability of advanced healthcare infrastructure will spur industry growth. Key industry players in the aesthetic medicine market have strong foothold in the U.S. High demand for technologically advanced devices and less invasive procedures will further elevate the regional growth during the forthcoming years. India aesthetic medicine market will witness 14.0% CAGR over the analysis timeframe. The growth is attributable to factors such as rising prevalence of obesity coupled with growing geriatric patient pool. As per the study conducted by the International Journal of Community Medicine and Public Health, more than a 100 million people in India, are obese. This will augment the demand for surgical as well as non-surgical fat reduction procedures in the region thereby augmenting the industry growth. Moreover, growing investments in healthcare infrastructure, rising disposable income leading to increased affordability as well as growing patient awareness pertaining to aesthetic procedures will drive the regional growth in the coming years. Some of the prominent industry players operating in global aesthetic medicine market are Allergan, Alma Laser, Cynosure, Galderma, Lumenis, Johnson& Johnson, Merz Aesthetics, PhotoMedex, Syneron Medical, Valeant International and Zeltiq Aesthetics. Key strategies adopted by most of the key industry players include acquisitions, mergers, partnerships and new product launch to strengthen product portfolio and maintain their market position. For instance, in July 2014, Valeant Pharmaceuticals International Inc. acquired PreCision Dermatology, a developer of high quality dermatology products with an aim to strengthen company’s product portfolio and widen its customer base.